Today I'm thrilled to have a guest contributor for Top-toberfest: Janine. Janine is a work at home mom that loves to craft. I'm so appreciative that she was willing to share her talents, and these great boys tops with us today. 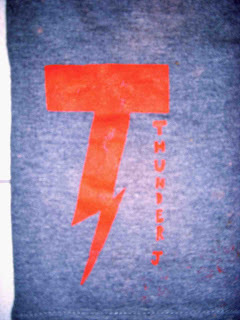 She uses a variety of techniques, including: freezer paper stenciling, hand stitching, bleach, hand painting, and bubble wrap, to create some custom tops for her son Thunder. My son’s name is Thunder Jason and I thought it would be neat to have fun with it and make him an original shirt. I find that boy’s clothing seems to be all the same and if you find something with words, pictures, etc it’s usually too over-the-top for me. I’m not a huge fan of all the cartoony pictures and cheesy sayings. I bought a plain, grey shirt from WalMart. First I washed it in case of shrinkage, then I sprayed some bleach on it. I would have used a bleach pen and done a more ’tatoo’ looking design, but I couldn’t find bleach pens anywhere in my town. 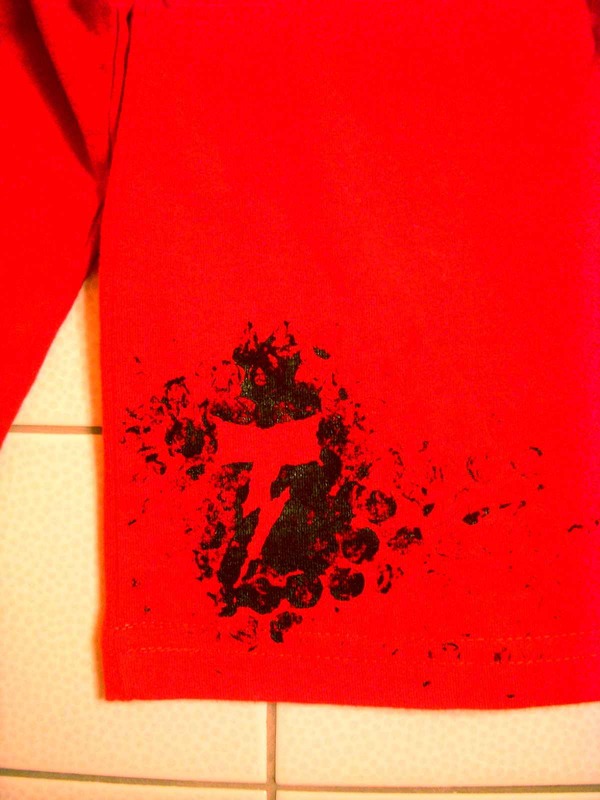 After washing the bleach out and drying it I made a freezer paper stencil like this. I followed Cheri’s instructions and used red Tulip fabric paint as recommended by her, painting in the stencil with a small paintbrush. I made a large "T" lightning bolt and the small letters spell 'Thunder J.' When the paint dried I painted some bubble wrap and stamped it randomly on the shirt. 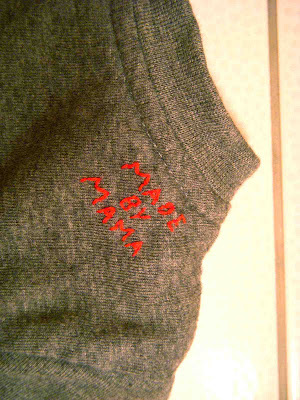 And finally I did some embroidery. 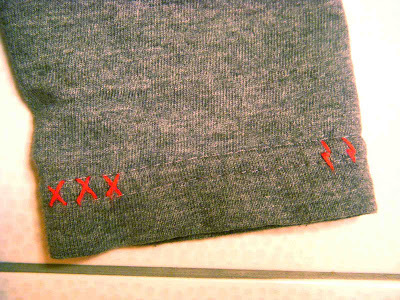 I made some tiny lightning bolts, ‘x’s on the wrist, collar, and bottom hemlines and embroidered “Made By Mama” on the shoulder. I’m SO happy with how it turned out! I‘ve also included pictures of 2 other shirts I made. 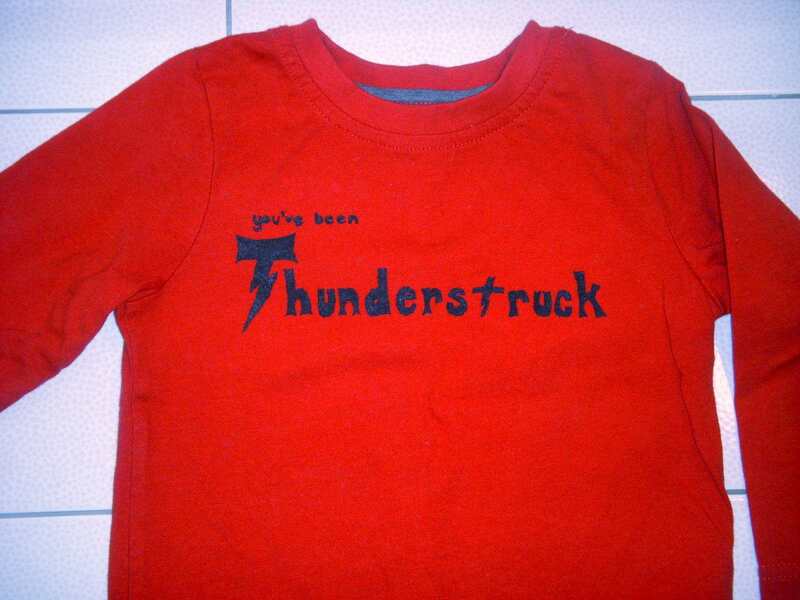 The red shirt says, “You’ve been…Thunderstruck” and was made using the same freezer paper stencilling and bubble wrap technique. Thanks so much Janine. 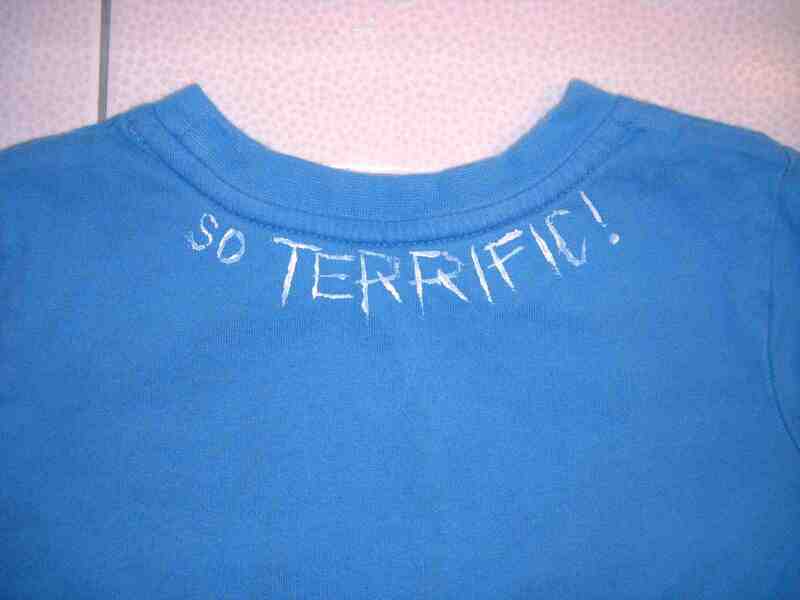 The tops turned out great, and I'm sure that your son loves them. I especially love the hand stitched details that you added, they really add something special. 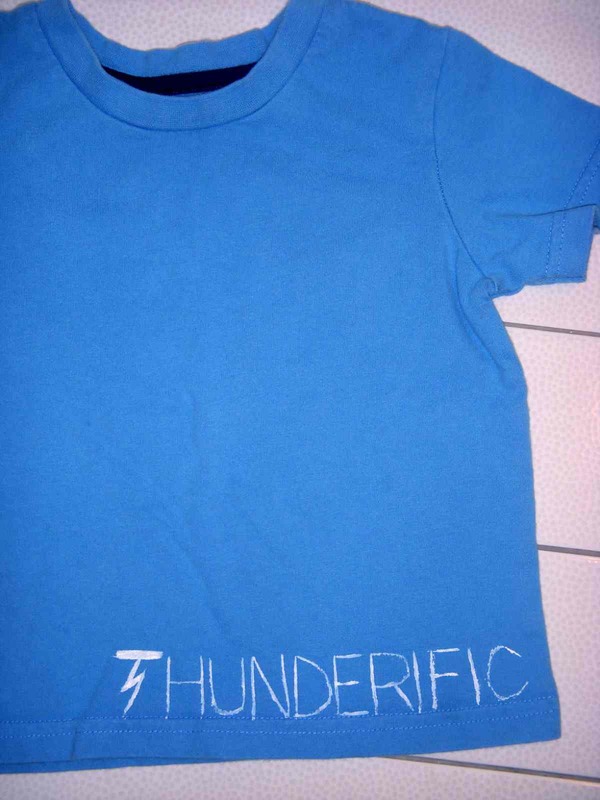 Want to share your custom tees or tops with us? 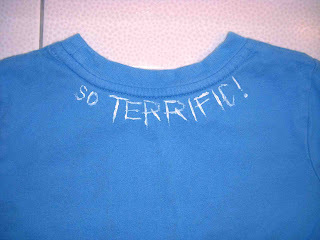 Link up all of your shirt related projects in our Top-toberfest link party. I'll be featuring some of my favorites from the party come November. What fun shirts! I'm going to have to try the bubble wrap thing.